Well, all I care about right now are roses. Hubby dearest got me a couple of long stemmed dark pink Roses yesterday. Ain't I the lucky one? Whoever discovered that Roses were edible contributed a lot to this recipe of mine. I love roses. Especially in food. I love Rose biscuits. I'm always ready to share a plate of butter Gulkand with fruits and ice cream. I am a die hard fan of Falooda. Cold rose milk with fluffed up basil seeds and a big scoop of Vanilla ice-cream - PERFECT! Well, that's a recipe for another day. Watch out, it may be coming soon, this summer. But today is not that day. Today is the day to celebrate the Rose Lassi. Many many years ago, when I was in college, my Mom and I spent a summer just having home made Lassi. We always had yogurt (curd) at home being South Indians. At 7 pm, after a hard days work, while my mom rested, I'd bring out the blender - chuck in some yogurt, sugar and ice and make us glasses of Lassi. We'd enjoy sipping it slowly while relaxing on cane chair in the sultry summer of coastal Goa. I remembered her fondly when I made this Rose Lassi. Lassi is awesome on it own, without any fruit or flavouring. But the rose syrup takes the humble Lassi to a fantastically new level. 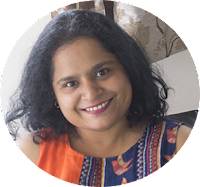 And it is just as easy to make as the original Lassi. 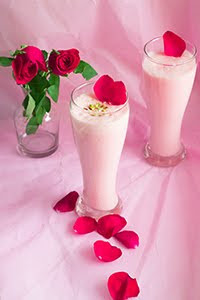 To make Rose Lassi, all you need are 4 ingredients - Yogurt, Rose Syrup, Sugar and Water or Ice cubes. If you like it really thick like the Punjabis, skip the water. It is creamy, it is Rose-y, it is definitely a WINNER. Rose Lassi is a rose flavoured yogurt based summer drink popular in North India. Blend together yogurt, rose syrup, sugar and ice cubes. I started with 2 Tbsp of rose syrup and 3 tsp of sugar. I increased it later according to my liking. I suggest starting with less and then increasing according to how sweet you want it to be. Don't forget the rose syrup is sweet too. Add water if it feels too thick. Garnish with finely chopped dry fruits.